This is the perfect time of year to knit mittens. There’s a crispness to the air that let’s us know summer is well and truly over. For those of us in northern climates, it’s the time of year when we start to browse though cozy winter sweater patterns, pondering the cold days to come. But not quite yet, today we can still add just a few layers as we head out to gaze at the turning leaves. In my neck of the woods, that means blue skies and golden aspen trees. It’s also the time of year to start thinking about holiday gift knitting. I was in trouble. I had published a “Quick Holiday Gifts” class to my fall schedule at the store (Jimmy Beans). Suddenly it was just a week away and I had no project, no ideas and nothing on the needles. Nada, zip, zilch. There was no time to panic so where should I start? A small project, Aran weight yarn and medium size needles. Something I could add a bit of a twist to and hadn’t knit before. Mittens were the perfect answer. No seams, because why have them if you don’t have to? Mittens that are designed fit your hand’s natural shape. Easy Afterthought thumbs that fit. Decorative stitch pattern and ribbing to add flexibility to the sizing. No seams means we’re starting from the top with Judy’s Magic Cast On. Standard shaping (plus 1 st each end, every other round) wasn’t giving me the curve I wanted, so I started to experiment. The curved top is created by increasing every round for the first four rounds. I didn’t want anything bulky, so I combined a yarn over with Knit 1 Back & Front (vs. front & back). Knitting into the back of the yarn over closes the loop. The closed yarn overs left a very tiny hole, so I also tried it with repetitive k1b&f increases. As you can see in the right hand photo above, the angular shape came right back. I returned to the yo/k1b&f combo and used my yarn tail to perfect it. As mentioned in the last post, I am heading to Australia for a few weeks and bringing only sock yarn. I will let you know how this shaping works with a much finer gauge yarn for my toe up socks. The fingers are shaped for the right and left hand to reduce bulk. Two lengths and the rounded top help ensure your fingers won’t feel cramped. Curved palm. The palm is knit with a slip stitch pattern. This firmer stitch pattern prevents sagging, adds some nice padding, and it curves forward just like your hand. The Afterthought thumb has some extra shaping around it to allow better movement. I had what I thought was a brilliant new idea for knitting the thumb using the Flat i-Cord. The Flat i-Cord was top of mind since I had just used it for the loop on the BYO Chimney Holiday Stockings announced in the last post. This seemed like an interesting alternative to knitting the thumb in the round. It worked too, but it was more difficult and more finicky that the standard. Out it went. I do think it might be a good solution for narrower fingers, so I’ll add gloves to the designing back burner. I’ve published enough Showy Cable projects by now that you’ll recognize and know I love them. These faux cables add texture and interest without the bulk of real cables. The ribbed Showy Cable pattern on the mitten in the cuff is ideal for adding flexibility. The two sample yarns have a very different content and feel. The tightly spun Cascade 220 Superwash Merino (label gauge of 20 sts per 4”) acts more like an Aran/heavy worsted (18 sts per 4”) on a US 7. It’s a nice soft and durable merino. The soft and light Rowan Kid Classic mohair blend (label gauge of 16-18 sts per 4”) does not have as much memory and was too loose when knit on the recommended US 8 needles. Dropping down to US 7 needles was perfect. These are delightful and luxurious, definitely a wow gift. 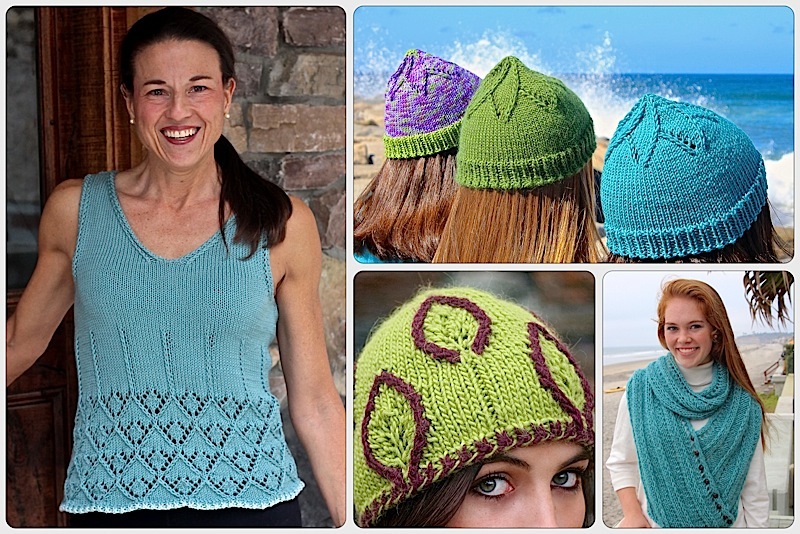 I had my doubts that I could design, knit and pattern this project in such a limited time. But I knit 7 mittens in one week! Each mitten was a better version than those that came before it. I finished up with second mittens in two of the yarns so I could photograph them for you. Oh, the things we will do! Picture if you will, a half crazed knitter (me) frantically trying to finish up the second gray mitten before the sun set. I was alone in Tahoe and previous attempts to selfie a mitten photo by twisting my wrists backwards were woefully unsuccessful. I set up my mini tripod and iPhone holder on a side table perched on top of another table, on top of my patio ottoman to get the right height. After the first few photos, I ran into the bathroom and added mascara to just one eye (the sun was dropping like a rock). With no time to fix my hair and wanting the focus on the mittens, my only solution was this peek-a-boo shot. I had a hard time holding my laughter long enough to get a picture. I wish you were there. I hope you like the mittens as much as I do. Since I too have holiday gifts to knit, I will be knitting more of them. By now I can knit them in my sleep. I think that the mittens look adorable. The story about the solo photo shoot had me laughing. I wished I lived closer to Reno. Lovely! I can just knit a basic stockinette stitch, but have made mittens. I’m guessing this sounds much too difficult for me. But, they are awesome! This entry was posted on October 18, 2018 by Laura Cunitz in Nuances, Patterns, Showy Cable and tagged Cascade 220 Merino, knit mittens, knitting, Rowan Kid Classic, Showy Decrease.